Reception Reminders: Mini Movers is on Tuesday Afternoons. Please ensure your child has a named bag with a pair of black pumps in school. Fruit is available free of charge daily. Toast is available daily, please send 75p in an envelope with your child's name, every Monday. Today the Road Safety Team came into school to talk to the children about the dangers of not wearing a seat-belt whilst travelling in a car. The children were really enthusiastic and answered lots of questions. They then created seat-belts for their own teddy. We discussed feelings and words to describe them. Later in the week, the children were asked to think about what choices and decisions they make every day. We celebrated Chinese New Year this week 'The Year of the Pig!' The children were able to talk about the similarities between how they prepare for their celebration with how we prepare for Christmas. All the children enjoyed a range of activities relating to Chinese New Year and all had the opportunity to taste a variety of Chinese food. Some children liked the food and some did not. Reception have been exploring the British Value of The Rule of Law. We have been discussing why we need to have rules and what would happen if we did not! The Fire Service came into school today to give a very important message to Year 6 about staying safe near water. The Firefighter set off the siren and asked if the children would like to have a turn at using the fire hose. The children were very excited! Today the Hearing Bus came to school. The children enjoyed the 'Look, Smile, Chat' Workshop. This session used resources for our hearing classmates to improve their deaf awareness and reduce the communication barrier. The session involved group discussion, myth busters, lip reading games and a video clip on communication. The aim was to increase children's' understanding of the communication difficulties deaf people can face and enable hearing children to communicate easier with their deaf classmates. Reception have been exploring the British Value of Democracy. We discussed making sure everything is fair and that everybody has a voice. 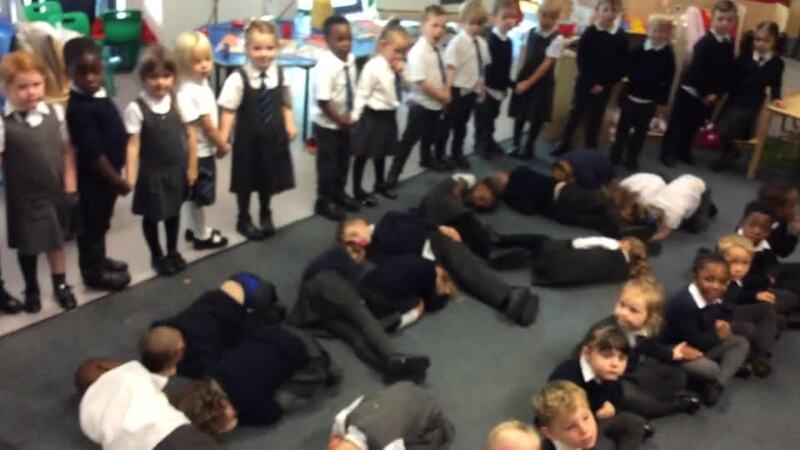 Both Reception classes created a collaborative piece of work relating to 'Peace.' The children painted the canvas and then we wrote words that mean peace to us. The children had an exciting day and they all looked fantastic in their costumes. We designed our own pop up books and attended a whole school assembly to see the winners of 'Best Outfit' and 'Best Book Design' for each class. Tuesday was Safer Internet Day. We talked about all the different things that we can do online, for example, a favourite game or app that the children like to play on. Then we discussed the importance of staying safe online. We looked at how when we are online we need to make lots of choices and "How would we feel if we were not given a choice?" The children were so excited to show all of you our Christmas Nativity. When the children returned to class they were really proud of themselves and all the staff gave them high praise for their performance! Reception created poppies to stick on our soldier display. We also painted rocks red to add to the whole school poppy display in our Peace Garden. Reception will always remember them. The Technology workshop gave our deaf children the opportunity to try out technology such as vibrating alarm clocks, flashing doorbells and Bluetooth devices. They really enjoyed trying out the different devices. Finally the children were shown how to use sign language. Today we held our celebration to give you an insight into some of things that we have been learning this half term. Our topic was 'All about me.' 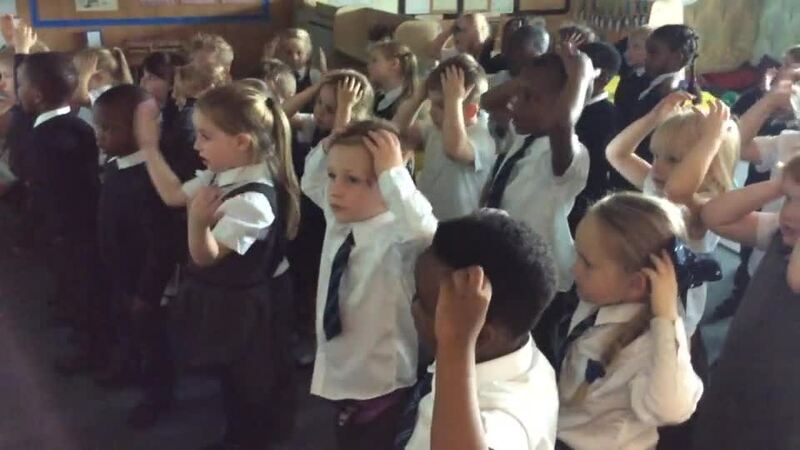 The children learnt 'Heads, shoulders, knees and toes' in French. The children also had the opportunity to work with you, creating 'Self Portraits.' We have to say that you all did a fantastic job. On Wednesday 26th September, the children celebrated European Day of Languages. They learnt how to say 'Hello' and 'Goodbye' in French and Polish and they learnt how to say 'Thank you' in French. The children made flags and they were also taught how to sing the song 'Heads, shoulders, knees and toes' in French. On Thursday 21st September we celebrated the International Day of Peace. We did lots of activities during the day such as painting doves and creating a whole class canvas. The children and staff want to thank you all for your continued support! This week we held our celebration to share what we have been learning this half term. Our topic this time was 'Winter' the children chose a variety of activities to share with you to show what they have been doing in class. Reading over the Parent feedback forms that you filled in, it was a huge success. Finally we listened to a story about Zap and Zoom who love to use the internet. We discussed questions relating to choice and if it was okay? Then by using two Hula Hoops one for Yes and one for No, the children voted. If you were not able to attend, take a look at our slideshow of the children in their costumes. Today Bishop John Arnold visited our school. He was very interested to know what Reception have been learning about. The children were very keen to share what they knew about Advent. Yesterday the children wore odd socks to school for our themed week on Anti Bullying. 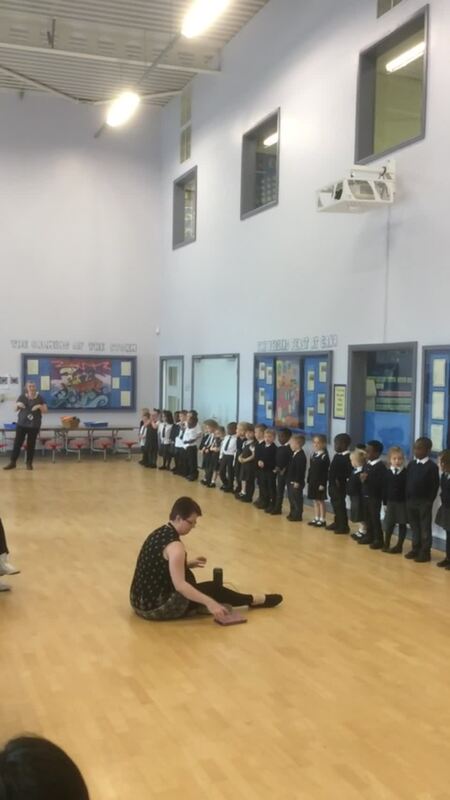 We had a whole school assembly led by Mrs Hartley where she explained what 'bullying' means and shared ways in which we can help others and stop bullying. The children were given the opportunity to observe the changes and decay in a pumpkin. They observed the changes and mouldy parts through the use of magnifying glasses and magnified tubs. The descriptive language used was fantastic! We hope you had a lovely afternoon and thank you to those who attended. If you did not get a chance to see, take a look at our video and slideshow.